In 'Are You There Alone?' O'Malley makes a critical contribution to our understanding of mental health issues within the criminal justice system. I followed this case thru the media when it happened and always thought that yes, Andrea Yates had mental health issues but she knew what she was doing. And after listening to this book, I feel even stronger that she should be in jail. Alot of things contributed to the untimely death but ultimately it all rest in Andrea Yates hands. I pray this woman never sees the "outside world" because I am sure she would stop taking her meds, reproduce and heaven help her babies! To say the author took Andrea Yate's side would be a stretch. But plenty of the blame for this situation is laid, via this work, a the feet of the Mental Health system. It is not discriminant, giving the local, state, and federal systems all a part of the blame. Obviously, Yates was sick. But I think the book went a little to close to "it wasn't her fault." Certainly it did for my liking. Narrator was also just OK. The crime is beyond all ability to understand, and this author would have you believe it was not Yates fault. 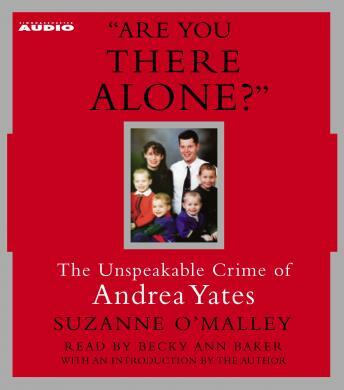 Aside from the rather uninteresting voice of the narrator, I learned quite a bit about Andrea Yates, why her husband still stands by her, and the events leading up to the tragedy of the deaths of her children. We are still living in the Dark Ages when it comes to understanding mental illness. The psychiatric treatment she received prior to the deaths was criminally inadequate. What a terrible waste. Not too bad of a story. But a bit confusing as the author jumps around alot. I guess this book is entirely what I expected. The crime and principal characters are thoroughly explored....all excpept for the fact that nothing much is said about what life is like for any of the family after the crime. I can't even imagine going from having five children or grandchildren to having none. If you really want to know what happened -right through the trial- then it's a good read. BUT, it seemed too empathetic to Andrea Yates. Andrea falls in a category of persons mentioned by Attorney Racehorse Hanes who said "Some people just deserve to die." An absolutely life-changing book. This clinically accurate portrayal of a mentally ill woman that committed a horrendous crime is heart-wrenching in its detail of a wonderful mother and saintly husband, caught in a perfect storm of chemical imbalance, religious fanaticism, and economic limitation that led to the deaths of their five children. I was in tears as I felt the pain of all those that love Andrea, and that loved her children. This is not a happy book, but it is a necessary book for anyone who doesn't like to judge a person or a situation based solely on the soundbytes presented in the nightly news. Very well written and presented. While I admit to having a morbid fascination with this horrendous crime...I am only halfway through and I feel only mildly intent to listening to the next 3 CD's. The reader is great, and the content is well written. It just seems perhaps a little too long on the subject without feeling like turning on some happy show tunes. In a Houston, Texas suburb, Andrea Yates drowns all five of her children. She is sentenced to life in prison for the crime. Even after her conviction and sentencing, questions remain. "What were the events that led to the murders?" "Why did she suddenly fill a bathtub with water that morning and methodically drown each of her children?" "Was she a lunatic?" "Why, after she committed such a horrific act do her husband and family still support her?" When you finish this book, you'll understand what happened and why it happened. You'll learn about the mental health system in Texas and how it tragically failed to accurately diagnose and treat Andrea Yates’s illness. You'll learn how the combination of psychosis, wrong medication and religious fanaticism combined to produce a killer. Well written and documented. If you want to better understand mental illness and why people sometimes act in unimaginable and irrational ways, read this book. I think the author herself makes an introduction, because the book begins with an awful crackling voice that made me turn my treble all the way down and my bass halfway up. Be aware that this is not the person who reads the whole book. The actual reader is not the best, but she's a blessed relief after the intro, and she does do a great Andrea Yates; sounds just like Yates in her interviews. The content of the book is quite depressing, and not good rainy day listening, but it's engrossing, and will make your commute go by. It's a fantastic account of the case, with enough detail to allow you to make up your own mind; the author herself, while having sympathy for Yates, does not "take her side," per se. If you want to know about the case, this is the book to have.